The Volvo Ocean Race 2017-18 will start from Alicante, Spain this October and finish in The Hague, Netherlands in June 2018. With almost three times as much Southern Ocean sailing as in the previous edition, the eight competing teams will cover the longest distance in the race’s history at approximately 45,000 nautical miles, crossing four oceans and making stopovers in 12 cities on six continents. Headquartered in Aarhus, Denmark, Vestas is the only global energy company dedicated exclusively to wind energy. 11th Hour Racing, a program of the Schmidt Family Foundation based in Newport, RI, establishes strategic partnerships within the sailing and marine communities to promote collaborative systemic change for the health of our marine environment. Vestas and 11th Hour Racing have joined forces to compete in the Volvo Ocean Race 2017-18 with one simple mission: Achieve exemplary results in sport and be the most sustainable team in the race. Charlie and Mark have been teammates for quite a while, beginning with their time as Brown Bears on the Brown University Sailing Team. In 2007, they were two of the 15 young sailors (age 18 to 23) selected for Roy Disney’s Morning Light Project, in which they sailed a TP52 in the 44th Transpacific Yacht Race and appeared in the documentary film Morning Light. They teamed up again on the Oakcliff All-American Offshore Team, enjoying success in several events including the Rolex Fastnet Race and the Transatlantic Race 2011. Most recently, they led Team Alvimedica to fifth place overall in the Volvo Ocean Race 2014-15. We caught up with Charlie and Mark to learn more about their mission to promote sustainability during this edition of the VOR…and to win it! WindCheck: Was there a defining moment in the Volvo Ocean Race 2014 -15 when you thought, “We gotta come back to this!”? Charlie Enright: We share a passion for the ocean, for sailing, and for doing things differently. We proved this in the last race by coming in with a young team and tasting our fair share of success. As soon as we showed ourselves to be competitive, winning some In-Port Races, and the final leg into Gothenburg, we knew that our story wasn’t over and we were already thinking about the next race. Mark Towill: This time ‘round, we have challenged ourselves even further by tapping into more robust professional and personal goals, returning to the 2017-18 edition backed by two sponsors with similar objectives. With the support of Vestas and 11th Hour Racing, we aim to win the race whilst leading the pack in terms of sustainability and continuing to prove ourselves as environmental stewards. How was your transatlantic sail from Lisbon…and the reception in Newport? MT: Our transatlantic crossing was productive. We achieved all the goals we established before we set sail, both in terms of boat and crew. It has been very positive. 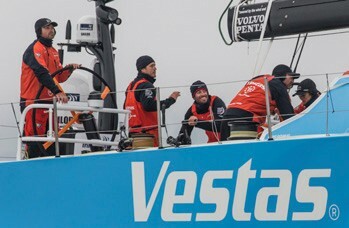 CE: It’s always fantastic to come into Newport – getting so many people out on the water to meet us so early in the morning in pretty dull conditions, is certainly a warm welcome and motivating for the team, and makes us look forward to the stopover in May 2018.
Who was aboard Vestas 11th Hour Racing for that voyage? We sailed the transatlantic with a mixed crew. We had several experienced sailors, some of whom we have worked with in the past and are hoping to secure for the upcoming race. Others were less experienced and underwent a steep learning curve very effectively, including some under age 30. We are still trialing crew members and finalizing roles on board, so it’s not strategic to share names right now, but we look forward to announcing them when we’ve had time to reflect off the back of the second transatlantic. Stay tuned! Please describe your crew selection process for the Volvo Ocean Race 2017-18. CE: The selection process is based on getting potential sailors out in realistic race conditions on our transatlantic crossings – it’s the perfect set-up to simulate a longer leg, and enables us to swap out crew candidates and get more people on board to trial. We’re the first team to cross an ocean ahead of this race, and we’re confident that this will allow us to get to know our potential crew well enough to make our final decision soon. Will we see any of your former Morning Light or Oakcliff All American Offshore Team shipmates on the roster? MT: We’re still trialing crewmembers, so you never know! What are the three biggest elements of sailing the VO65s that you know you can improve on from the 2014-15 edition? MT: Watch rotation – of course this will depend on the final crew combination and responsibilities on board, but it’s always something to pay attention to. CE: Using the sail inventory in the best way possible – we have one new sail on board (the J0), which we expect will improve performance upwind in light air conditions. All other sails remain the same. MT: The crew selection will be key on-board, with more Southern Ocean sailing, and different crew combinations available to the team, including mixed crew options, which can allow us to optimize crew performance on different legs. What are your thoughts on the revised racecourse, particularly the triple mileage in the Southern Ocean? CE: Southern Ocean legs are always appealing and exciting for an offshore sailor. It is going to be wet and wild for sure, but it will also make decisions on board all the more crucial. It could very likely be where we see this race lost and won, not least for the double points available. We’ve heard that your boat is the old Alvimedica. Is this true, and was that planned or just luck of the draw? Is it a bit of a homecoming, or merely the tool with which you race? CE: We are using the boat we raced on in the last race. It’s not exactly luck of the draw – the boats are refitted in the order they were originally built, and we’re in good standing to have had first say on boat number four of eight available for the line-up of the next race. If we had sailed on one of the later boats in the 201415 race, which are still in refit, it would have been difficult to be logging the training we are doing now. MT: It is nice to be back on board for sure. There is the legacy element for us sailors, of course, although on paper all the boats belong to the one-design Volvo Ocean 65 class. This means that each one has been refitted in the same way, and technically, there should be nothing to differentiate the fleet (except for the team colors) on the start line in Alicante in October. Since you are now the de facto faces of a 14 billion Euro, publicaly traded global company, are you working on your public/TV persona? CE: It is certainly exciting, especially because it provides us with a wider platform to communicate our message on sustainability, through the means of wind and water, the key elements that are behind our partners’ organizations. We are working on our joint campaign and aligning objectives ahead of the race with both Vestas and 11th Hour Racing. MT: This is not about creating a persona though, it is about doing something that we truly believe in…and we could not ask for better backing. Neither of our two title sponsors is a stranger to this world, so we have a close relationship and hope to build on that experience. What initiatives are you implementing to promote the respective missions of Vestas and 11th Hour Racing? CE: We are currently working on a wide-reaching campaign that will get our guests, visitors and fans involved at each of the stopovers and across our channels. 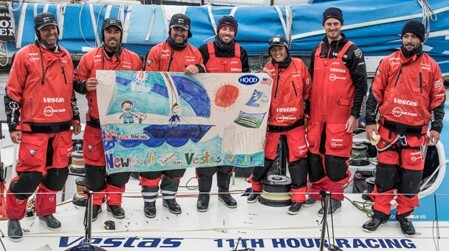 Aside from this, we will welcome a large number of corporate guests on the Vestas side throughout the race, beginning already on our visit to Newport last month, and the same goes for many 11th Hour Racing grantees and partners, who we will continue to collaborate with. Our campaign will have a strong focus on youth engagement and inspiring the next generations around environmental responsibility. What sustainable practices will you be employing during the race? MT: Our goal is to run the Vestas 11th Hour Racing campaign with a robust sustainable strategy in place across all operations. The main areas of focus will be NO single-use plastics; Sourcing local food and sustainable seafood; responsible procurement; responsible waste management; responsible use of resources (water and energy); and education and outreach via on board reporting from race, activations at stopovers, and social media/fan engagement campaigns. Sponsored by the only global energy company dedicated exclusively to wind energy and an organization that’s uniting the sailing community to save our oceans, this team aims to win the Volvo Ocean Race 2017-18 while leading the fleet in sustainability. © Stephen Cloutier/PhotoGroup.us. You are relatively young compared to some of the other VOR skippers and other professional sailors. Is sailing at a high level really a viable option as a proper life – not just a living – for young sailors? CE: There is no doubt that the world of competitive sailing has changed over the years, but it is about how you adapt to these changes, and this is what makes us different. We are professional sailors, but we are also constantly thinking about our future and our next career move. We are aware of what it takes to build a campaign and we are fully committed to it. MT: We also know that finding sponsors and promoting a campaign works best when it means something to you and to the rest of the team, so it is important to surround yourself with the right people who share your values and ethos. If you have a vision, set goals and deadlines, you certainly have a good chance of making a strong and long successful career out of sailing. How about some advice for an aspiring high school sailor who is excited by the VOR, the America’s Cup, TP52s, etc.? MT: Stick with it and take all the opportunities that present themselves along the way, bearing in mind that you are surrounded by a fast changing and competitive environment. CE: Build your persona and your network – find contacts that can help you achieve your goals – but most importantly, enjoy what you are doing and do it for a purpose that is meaningful to you. Special thanks to Alessandra Ghezzi, Director of Communications at 11th Hour Racing, Inc., and TJ McMaw, Vestas 11th Hour Racing’s Senior Project Manager for Campaigns and Communications, for their assistance with this story. To learn more about Vestas 11th Hour Racing, visit Vestas11thHourRacing.com and follow the team on Facebook at facebook.com/Vestas11thHourRacing. For more information on the Volvo Ocean Race 2017-18, log onto VolvoOceanRace.com. The Oakcliff Development Team, based in Oyster Bay, NY, has begun work with Vestas 11th Hour Racing. 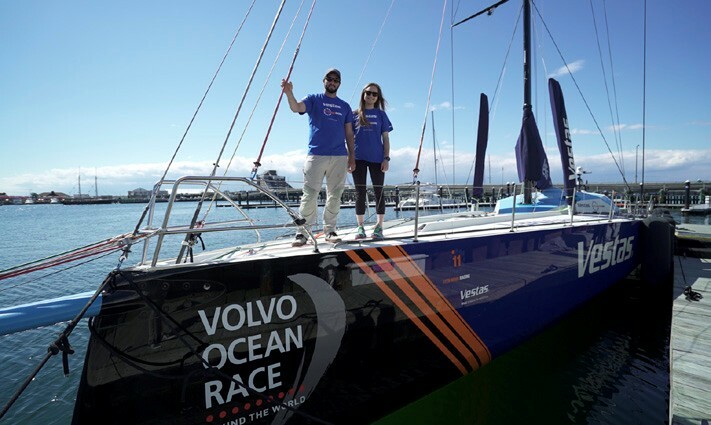 The first team, consisting of graduates Madeline Gill ‘12 and Sean O’Halloran ‘16 have spent the past two weeks in Newport, RI, elbow deep in the hard work of preparing a Volvo Ocean Race campaign. In recognition for the support they received from the Morning Light Project and the Oakcliff All-American Offshore Team, Towill and Co-Founder/Skipper Charlie Enright are offering young sailors this opportunity in the world of competitive sailing. As dedicated environmental stewards, Towill and Enright help them understand what it takes to build a team and run a campaign sustainably. Vestas and 11th Hour Racing have joined the Volvo Ocean Race 2017-18 with the mission to achieve exemplary results in sport and be the most sustainable team in the race. Before joining Oakcliff Sailing two years ago, Sean O’Halloran wrote, “My goal is to join the Volvo Ocean Race for the next edition as part of a shore crew, and then hopefully as a crew member in a following edition of the race!” O’Halloran grew up in Santa Clara, CA and skippered as a member of the sailing team at Johnson & Wales University in Providence, RI. The Oakcliff Development Team is comprised of graduates of the Sapling program, with skills in all aspects of professional sailing, from the shore to the water. Two Oakcliff graduates will be embedded with Vestas 11th Hour Racing at each stopover of the Volvo Ocean Race. There are currently 165 graduates, and the expected 40 or so program participants from this summer will also be eligible to participate.